Taking cues from feedback in 2016, transit officials on both sides of the Hudson River this year collaborated on a new way of speeding weekend riders on the Port Authority Trans-Hudson (PATH) subway into midtown Manhattan from New Jersey during scheduled service disruptions. This year’s improved customer service program constitutes both an achievement and a model for further collaboration among transit agencies in the New York metro area. Here’s the story of how this latest innovation came together. Instead of busing PATH passengers displaced by weekend signal upgrades on the agency’s midtown Manhattan line, this summer and fall the Port Authority routed riders to downtown Manhattan on PATH’s Newark-World Trade Center line. At the exit gates, each PATH rider was offered an MTA MetroCard valid for two trips on any of the MTA’s subway lines and bus routes, several of which are an easy transfer at PATH’s southern terminus. PATH is nearing completion of a multi-year project to upgrade its signal system with modern technology. The new system will enhance service, especially during peak travel times, by enabling more trains to safely run closer together. It will improve the diagnosis and prevention of service issues, and provide real-time train arrival information to passengers. It also meets the US Government requirement for railroads to install Positive Train Control (PTC) by December 31, 2018. PTC is designed to prevent crashes by safely stopping a train if the human operator misses a red signal. Transit systems that operate 24/7, including PATH, typically schedule routine maintenance overnight and on weekends. Maintenance crews complete their work in short bursts, and move out of the way of oncoming trains in order to maintain regular service. The PTC project, however, involves the installation and testing of an entirely new signal system, including miles of new signal cables, conduits, and other trackside equipment, so crews need uninterrupted access to segments of the rail system. Fortunately, the PATH system has two branches serving New York: one extends to 33rd Street in Midtown Manhattan, and the other serves Downtown Manhattan at the World Trade Center. PATH used this design flexibility to close the 33rd Street line from 11:59PM Friday to 5:00AM Monday on weekends from July to the end of October, and redirect all service to World Trade Center. 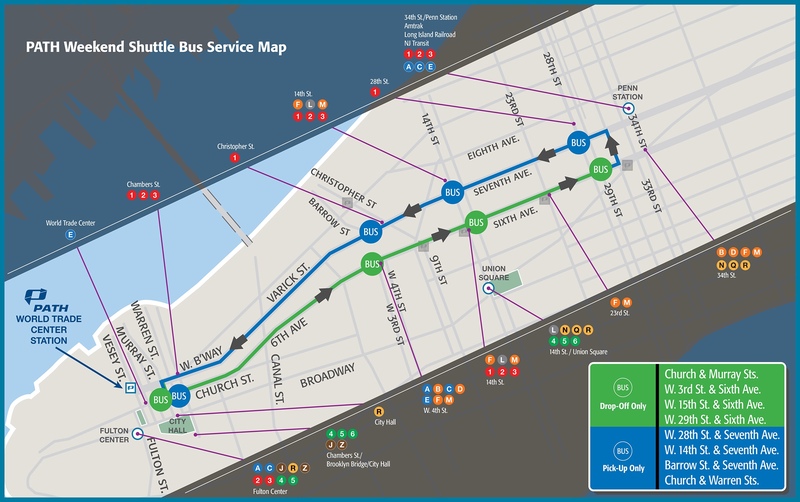 On the weekends in 2016 when service to 33rd Street was suspended, PATH provided free substitute bus service from the World Trade Center station to a series of street-level stops roughly mirroring service to 33rd Street. This service was intended to ensure that PATH customers were not required to pay a second fare to reach their Midtown destinations via the New York City Subway, which is operated by a peer agency, the Metropolitan Transportation Authority (MTA). The bus service received some criticism from within the transit advocacy community. Yonah Freemark, author of The Transport Politic, suggested the shuttle bus service indicated the agencies couldn’t—or wouldn’t—work together. PATH has chosen to shuttle its passengers rather than take advantage of existing New York City Transit Subway services, giving them vouchers to use on the buses instead of working with the MTA to let riders take advantage of the trains it is running. It is a disappointing reflection of the state of cooperation between the Port Authority and the MTA. Benjamin Kabak, author of Second Avenue Sagas, framed the issue in economic terms. Allowing PATH riders to transfer to the subway and vice versa is simply an economic exchange. The PA could pay the MTA, and the MTA could provide free transfers. One obstacle is how the MTA can’t exchange PATH’s SmartLink cards, but these are solvable operational problems, not intractable obstacles. Notwithstanding some negative assumptions about the agencies, Freemark and Kabak raise valid points about streamlining the customer experience to make transit an easier, more appealing travel option. Agencies can dramatically enhance the customer experience by collaborating on the connective tissue: maps, wayfinding signage, service information, and payment. These elements can be modified and updated more frequently, and at a lower cost compared to the concrete elements of transit, like vehicles, tracks, stations, and signal systems. Based on customer input and usage statistics from 2016, PATH and the MTA, in collaboration with the PATH Riders Council, developed a new plan for the 2018 PTC weekend work periods. 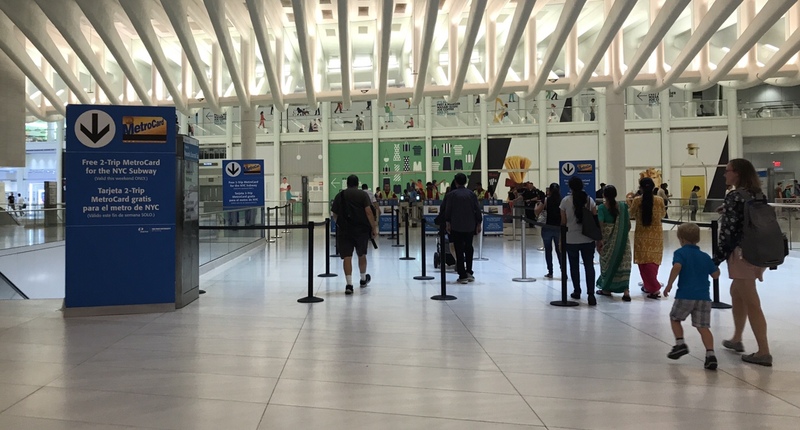 Instead of shuttle bus service, customers arriving at World Trade Center receive a free, 2-trip MetroCard for use on the New York City Subway or Bus. 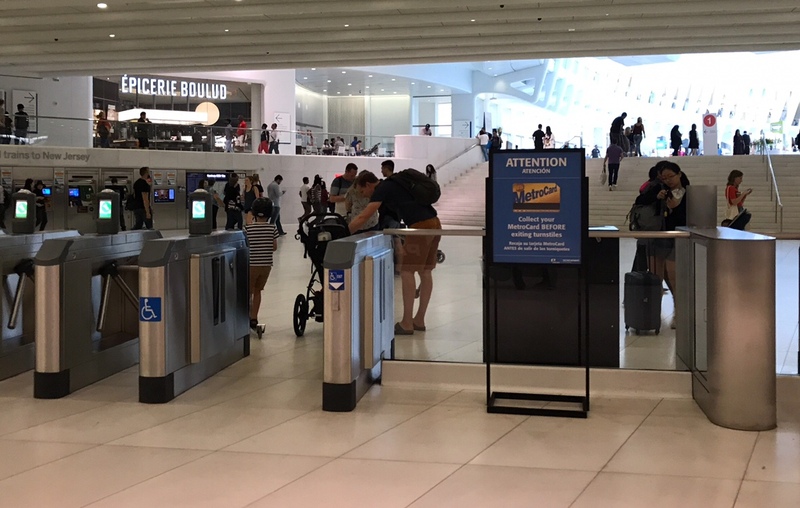 Signage at World Trade Center guides customers to the MetroCard pickup points, and reminds them to get a MetroCard before exiting the PATH fare gates. For customers, the availability of free, 2-trip MetroCards is a tangible indication that transit providers are thinking from the customer perspective. A MetroCard in hand represents a personal, direct gesture of thanks for their patience and understanding during service changes. It also means that any extra bit of inconvenience is mitigated by the fact that the ride is free. Seth, a PATH customer from Hoboken, NJ, described the MetroCard experience positively, and noted that it made the service changes much more palatable. Receiving a free 2-trip Metrocard made the weekend PATH service changes much more palatable. Communication around this was excellent: it was very clear why they were being made available and how long they were good for, and rather than having to search for them after getting off the PATH, it was obvious where to get them to continue my journey on the subway. For staff in both agencies, a project like this one offers opportunities to build new relationships, deepen existing ones, and build trust that will support future collaboration on projects that benefit the customer. For example, the MetroCards distributed to PATH customers each weekend are batched separately from MetroCards sold throughout the New York City Subway. This enables detailed measurement of PATH-to-Subway customer flow on weekends, which can be used to forecast future customer-focused initiatives. The MetroCards distributed each weekend expire at 5AM on the following Monday. This eliminates a potential incentive for people who might try to collect numerous cards and use them for free service, or resell them. Restricting the cards in this manner was important for the agency approval process because it demonstrated that the program could be delivered in a cost-effective manner. For the PATH Riders Council, this project represents an important outcome of constructive collaboration between rider and provider. The PRC advocated for this idea in our conversations with PATH, and the agency listened – and delivered. This is solid evidence that agency values the input and perspective of its rider advisory board, and is an important motivator for future collaboration. For everyone involved, this project is an exemplar of Voltaire’s aphorism, “don’t let the perfect be the enemy of the good.” Instead of waiting for future fare payment technology to be available throughout the region’s transit systems, everyone involved worked with the tools at hand, and created a solution that demonstrably improves the customer experience. As a result, this collaboration on weekend MetroCards has laid crucial groundwork that will benefit the New York and New Jersey region as it moves toward a new generation of fare payment in the near future.